Yo, Nebraska cyclists: LB 716! Look up your state senator here, and contact them. Do it today! Your state leaders need to hear your specific, local story about why the traffic law amendments in LB 716 are important for bicyclist safety in our state. 1. LB716 clarifies that where a bike/multiuse path crosses a road at a traffic light, cars must yield to bicyclists who lawfully enter the crossing. Currently, the law is mute on bicyclists vs. cars and only provides protection to pedestrians in these cases, so if the light turns green for the cyclist, they proceed, and are hit by a car, there is no clear rule for who should have yielded. There may be more, depending on how pathway development proceeds in Scottsbluff. Here’s a more formal-looking link to the S-G sites, as well as one for Sidney. PLEASE COMMENT if you know of additional intersections in other communities. Here’s a NeBA map of all the currently known affected intersections in the state. 2. LB716 eliminates the requirement that a cyclist use a sidepath when present. Note that the street is clear and almost completely dry. Write your state senator today! As your constituent, I ask that you support LB716 to amend traffic rules relating to bicyclists. The law as currently written creates uncertainty and danger for bicyclists like myself. LB716 will improve conditions for bicyclists in District 48. When I’m riding my commuter bike, I often use the Monument Valley Pathway. There are two places where this pathway crosses a road at a traffic light: at 10th Street and Mobile Avenue/Twin City Drive in Terrytown and at Five Rocks Road and Country Club Road in Gering. I always enter these intersections with extreme caution, as, in my experience, drivers are not generally very cyclist-aware in this area. Despite my caution, I have had some close calls. I would like to know that, if the unthinkable happens and I am struck by a car in one of these intersections, the driver will be held as accountable as if they had struck a pedestrian, another type of vulnerable road user that already has protection under the law. While I prefer to use the pathway when I’m riding my commuter bike, I’ve found several instances in which it was safer for me to be in the street rather than on the pathway. In the snowy season, the streets are often clear of snow long before the pathway is. I would much rather ride on a cleared street than on an icy and rutted pathway. At times when riding near Terry’s Lake, there has been a family of geese with hissing, overprotective parents occupying the pathway. Rather than risking injury by waterfowl attack, I have detoured into the street. Depending on the time of day, the pathway is sometimes occupied by people with dogs and small children who have a tendency to make unpredictable movements. When the pathway is crowded like this, and I’m moving 8-10 miles per hour on my commuter bike, I deem it safer for all involved if I move out into the street to get where I’m going without risking a collision with a dog or child. Similarly, when I ride my road bike, on which I can travel at speeds approaching 15-20 miles per hour, it’s much safer for all involved if I’m on the road rather than the pathway. The pathway was not designed to safely handle traffic of that speed. Yet, in the eyes of the law, whenever I detour into the street on my bike for safety reasons, I am courting a citation. This makes no sense and limits the utility of a bicycle as transportation. Since my husband and I rely on our bicycles to get around because we share one car between us and there is no practical public transportation in Scottsbluff-Gering, the bicycle-friendliness of this community is important to our ability to do business and live happily here. I know there are other families in this area that rely on bicycle transportation to get around as well. Passage of LB716 will help to make life a little better for all of us bicyclists. Please support it. 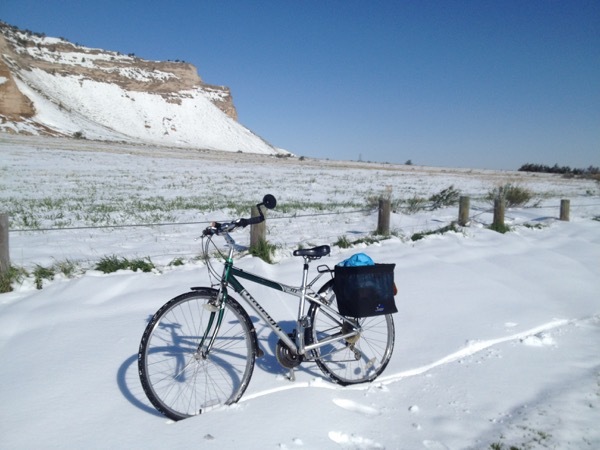 Since today is Monday of National Bike to Work Week, and also because I’m participating in the National Bike Challenge, I decided it would be a good idea to ride my bike instead of driving to Scotts Bluff National Monument for my regular hike up the bluff. Yeah, we’d gotten somewhere around 7-10 inches of heavy, wet snow over the weekend. So what? It was already melting, and the roads were clear. The bike paths and sidewalks, it turned out – not so much. 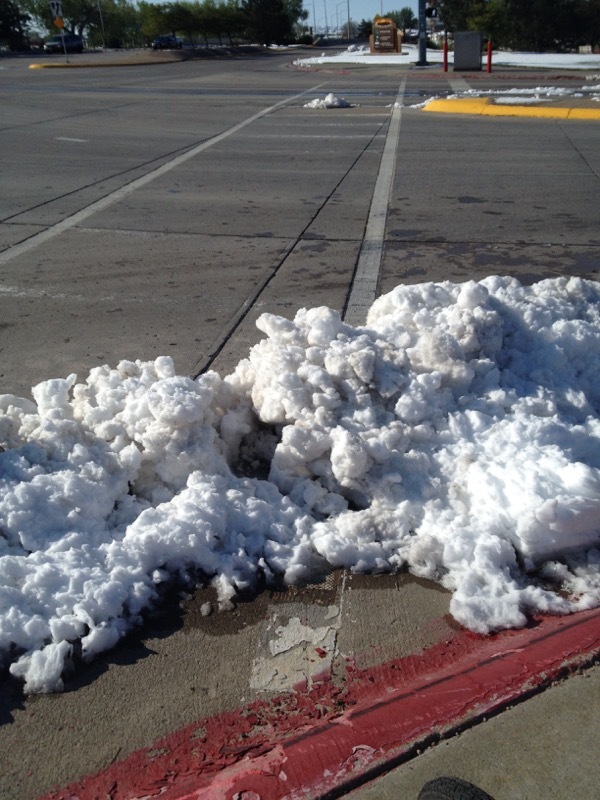 There were the dreaded “plow mountains” blocking access between sidewalk and crosswalk. This particular specimen, at the northwest corner of Beltline and Broadway, was difficult enough to walk over, let alone try to traverse with a bike. Sidewalks weren’t really an option for riding in many places. 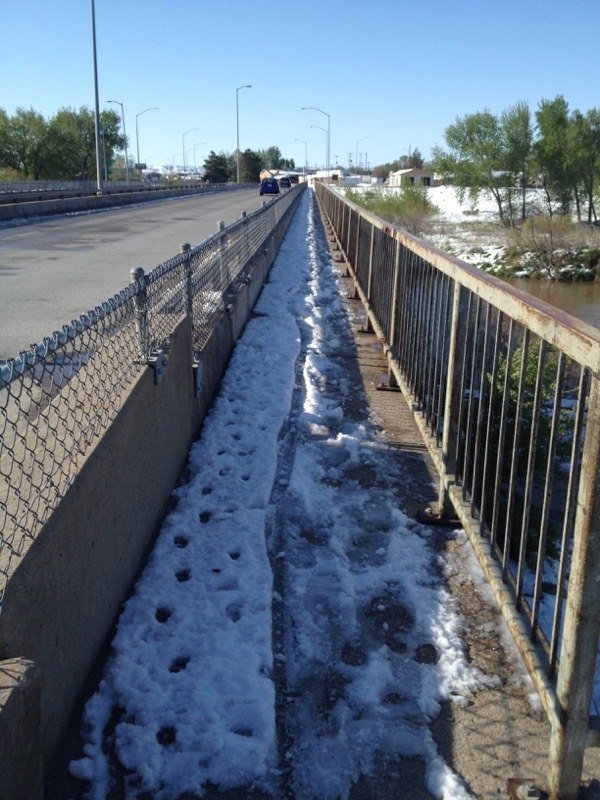 The Broadway / 10th Street bridge was the worst – slushy and chunky and icy. I was a little afraid even walking over it. NOTE: this is a big problem for non-motorized transport in the area, as there are only two in-town river crossings, and the Broadway / 10th Street bridge is the only one with a sidewalk. Both sides of the street were nasty. I checked. I dismounted to walk across the bridge. I had to dismount again when I hit a stretch of snow-covered pathway in Terrytown behind the Carpenter Center. 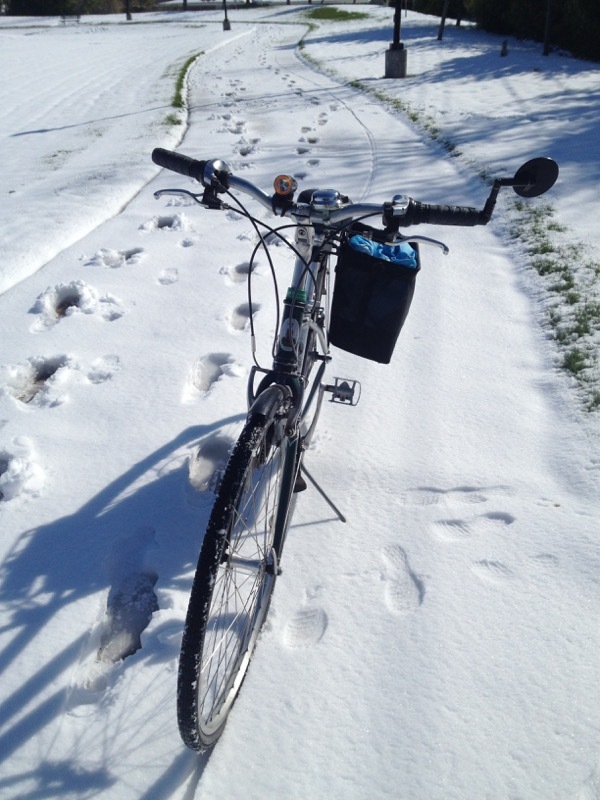 I really have never ridden in snow before, so I was not prepared for the way my bike bogged down as I hit a long patch of thicker thaw-freeze snow. I didn’t have my bike in a low enough gear and I slowed too much and lost balance. So, that was all the unpleasant stuff. 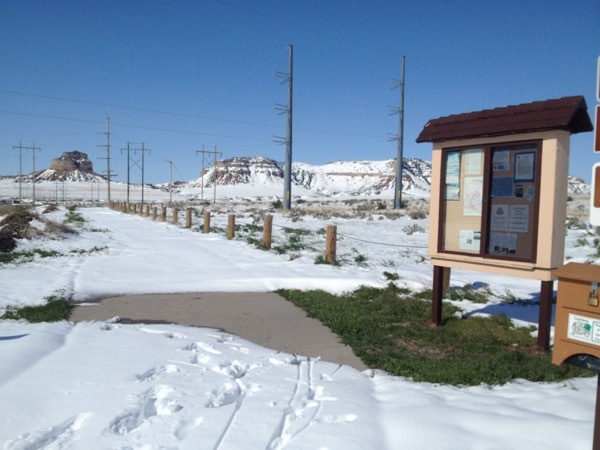 Now we get to the fun part: the snow-covered north-south leg of the Monument Valley Pathway adjacent to SBNM property. I downshifted and tackled the snow-encrusted pathway head-on. Trouble is, the wind rushing around the contours of the land and the boundary fenceposts had sculpted the snow into irregular drifts. 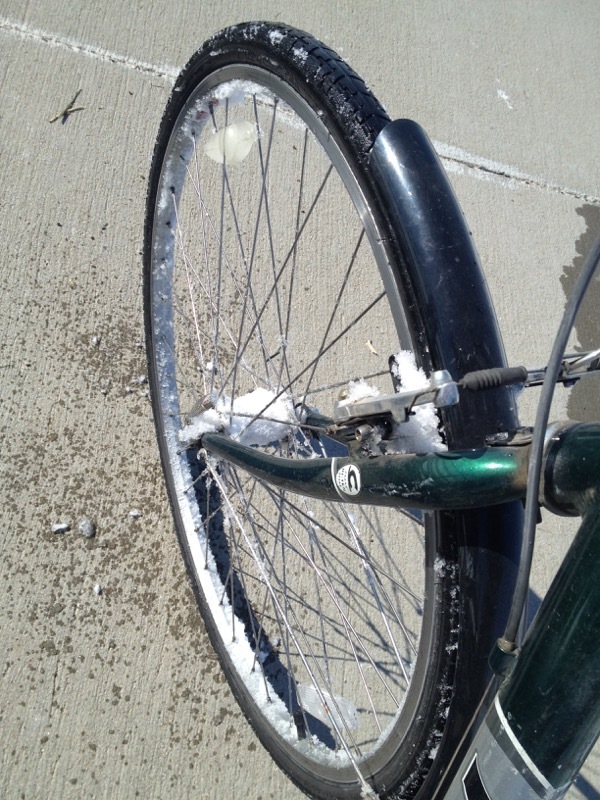 When I hit a drift that was deep enough for my pedals to scuff its surface as I passed, my forward progress ceased. Nice place to get stranded, eh? I was starting to have fun learning to buck the drifts, so, rather than turning around, I walked the bike until there was a shallow enough patch of snow that I could get some traction and get going again. I slid and skidded, delighting in the sound of the snow crushing under my tires. It was a good thing I was going slow enough that I wouldn’t need to brake to stop: my brakes packed with snow and ceased to function. A rare dry point on the pathway. I learned that by jerking up on my handlebars just as I encountered a deep section of snow, I could improve my chances of being able to ford the drift by staying more on top of the snow instead of plowing straight into it. It was a real workout getting through that snow, and a challenge to stay on the wide path as I wobbled between drifts. I decided that if the narrow, winding, hilly path across SBNM property to the Visitors Center was not plowed, I would turn around and go home. I’d already worked up a sweat, and I didn’t want to go careering off the path and land on a yucca or prickly pear hidden under a snowbank. Rats. Time to turn around. I thought that on the way back, with the day warming and the snow starting to melt, I would have an easier time getting through the drifts. That turned out not to be the case. I was glad when I could finally get back out into dry pavement again. I bounced the bike a couple of times to knock off the snow and cleaned out and tested my brakes before I headed downhill on Country Club Road. 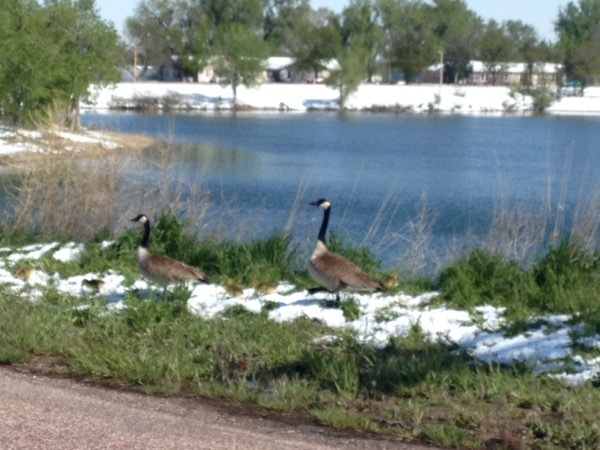 Baby Canada geese and their parents in spring snow next to Terry’s Lake. Here’s hoping the snow melts fast! Today Bugman and I ran 8 training miles. My pace was somewhere around 12:30 minutes per mile, which is embarrassing to me, as I used to be about 2 minutes per mile faster. BUT, as folks keep reminding me, I am lapping everybody on the couch! My leg muscles were all tired afterward, but I think I was able to keep up the pace thanks in part to a new “miracle” breakfast food I have discovered: steel-cut oatmeal with Reeses Pieces. You get the protein in the peanut butter, a blast of sugar, and some oaty fiber to even out the sugar uptake. I have never purposely bought Reeses Pieces, that I can recall (I generally prefer chocolate with my peanut butter), but I happened to have home some of the candies as part of a candy bouquet I nabbed at a charity silent auction the night before. I think I just might buy them on purpose in the future . . . The route I chose this morning crossed back on the Monument Valley Pathway twice. I enjoy running on the pathway and looking out on the (currently very, very low) North Platte River and the waterfowl and other birds along its banks. The city has recently installed some some neat signs along the river pathway that tell of the history of the area, in English and in Spanish. Many of the signs refer to the Oregon Trail pioneers and early settlers. One of the signs is titled something like “Turn back?” in reference to the difficult choices the pioneers faced. As a runner, I decided I would prefer not to see a sign that puts the idea of turning back in my head. It’s hard enough to keep putting one foot in front of the other without subliminal messages about quitting! It’s funny, but we can’t seem to go out in this town without running into somebody we know. Our route today took us past the humane society shelter, where one of Bugman’s colleagues was out in the yard with his family, test-driving a couple of dogs. Out on 20th Street, a pickup truck slowed down, and we recognized the driver as our friend Kathi of Open A Bar 2 Ranch, who heads up the winter farmers market. Oatmeal, peanut butter, history, scenery, friends – add to that sunshine and a nice breeze, and you have yourself a perfect day for a run!